At Fresh Cut Lawn Service, LLC, we believe the best compliment we can receive is a customer referral. When a satisfied customer passes our name along to family and friends, we are honored. With Fresh Cut's "Refer A Friend" program, when you pass our name along to family and friends, you could get paid! 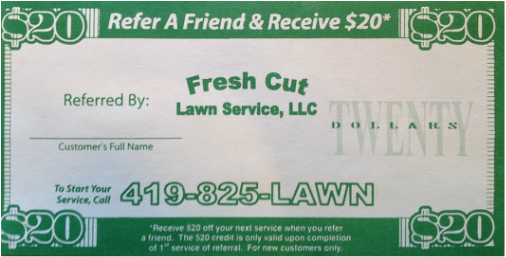 If you pass our name along and they become a new Fresh Cut customer, you will receive $20.00 off your next invoice! Just have your referral tell us you referred them to us or you can submit their information at the "Refer A Friend" link. Let Fresh Cut Lawn Service, LLC use your property for a "showcase" to your neighbors and receive $5.00 off your next invoice! 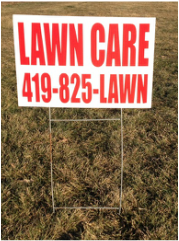 If you allow Fresh Cut to post a "Lawn Sign" in your yard for a month, we will deduct $5.00 off your next invoice. To take advantage of this offer, submit your information at the "Showcase My Property" link. Copyright © 2014-2019 Fresh Cut Lawn Service, LLC. All Rights Reserved.